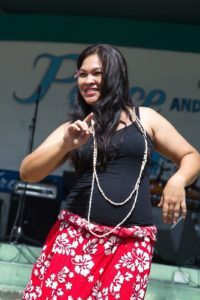 Amid global political tensions that include the island of Guam’s identification as a target of a missile strike by a foreign state, the Guam Municipality of Tamuning-Tumon-Harmon (“Ta-Tu-Ha”) courageously continued its tradition of promoting peace, friendship, diversity, and cultural exchange – not only for the citizens and visitors of Guam, but for the entire world by hosting its Sixth Annual Latte Peace Festival at the Tamuning Mayor’s Office Park on January 20-21. The annual festival is hosted by the Tamuning-Tumon-Harmon mayor’s office. This year, co-sponsors included such community partners as the SGI-USA, the International Committee of Artists for Peace, the Mayors’ Council of Guam and the Guam Visitors Bureau. “Latte” is the name that the Chomorro (persons indigenous to the Mariana Islands) use for the carved limestone pillar that was used, historically, as a key element in ancient building-support as well for the creation of monoliths to honor their ancient ancestors. During the opening ceremony Mayors’ Council of Guam (MCOG) Executive Director Mr. Angel R. Sablan welcomed attendees to the festival later pointing out that the festival is held beside the busiest intersection on Guam where, in addition to the participants in the park, thousands of individuals saw the festival in progress on a 12’ x 12’ video display that faced the street focusing on all of the performances onstage. The ceremony included the posting of colors by the John F. Kennedy High School Air Force Junior Reserve Officer’s Training Corps (ROTC) and the singing both of the United States of America National Anthem and the Guam Hymn by Ms. Fantaysha Rioja. Mr. Sablan introduced Mayor Louise C. Rivera (the mayor of Guam’s Tamuning, Tumon, and Harmon municipality and Festival host) calling her his “Symbol of Peace”. Mayor Rivera warmly expressed her thanks to the Festival’s sponsors including Mr. Angel Sablan, Leah’s Fabulous Productions, Buddy’s Home Furnishings of Guam, Bank of Guam, American Legion, VFW, John F. Kennedy ROTC, Ms. Fantaysia Rioja, the Governor of Guam, the International Committee of Artists for Peace, the Catholic Daughters, MPC Members, the Mayor’s Office Staff and volunteers, Vendors, and Entertainers for their support of the event. After the Lt. Governor’s statements, came the ceremonial “Lighting of the Lattes”. Installed in the Tamuning-Tumon-Harmon Mayor’s park are three, large Latte stone replicas that also serve as torches. The two outer Latte stones were already alight as the Mayor joined with Lt. Governor and a small group of participant-sponsors to bring the two outer flames together to light the center flame signifying the Festival’s purpose of unifying all in an observance of peace. The completion of the opening ceremonies was celebrated by all with the song “Let There Be Peace on Earth” marking the beginning of two days of diverse, cultural celebrations expressed by many groups through music, dance, food, art, and conviviality.